It is a question that makes you think – What Would You Do If You Were Told You Had Alzheimer’s – it is also a question that Lynda Simmons answers, at least for her protagonist Ruby Donaldson. Ruby has just learned that she has a new friend, Big Al, (Alzheimer’s) and her immediate thoughts are of her family. How can she prepare them, protect them, and still maintain her independence? However, her family is estranged and stubbornly uncooperative. Even after they find out that she is ill, they find it hard to be sympathetic. Raising yet another question-- when a terminal illness hits is it really that easy to forgive and forget the misdeeds of the past. Lynda delves into all those questions with skill, heart, and thoughtful reality. Her characters are people you know, the family dynamics genuine, but with any terminal illness, there is no happy ending. Yet Lynda Simmons gives you an ending that you will find satisfying, because it is selfless and filled with the warmth of genuine compassion. It brought tears to my eyes and required a handful of tissues to get through, but it was one of the most beautiful stories I have ever read of love and forgiveness, while staying true to the strength of its main character. 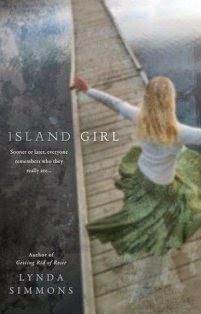 I highly recommend ISLAND GIRL. Ruby Donaldson will be someone you will recall fondly as a friend who touched your heart because Lynda Simmons created her that way. Join us Thursday afternoon for a fascinating conversation. Or call (347) 215-9536 – you can listen to the show or ask Lynda a question. All shows are downloadable from iTunes.